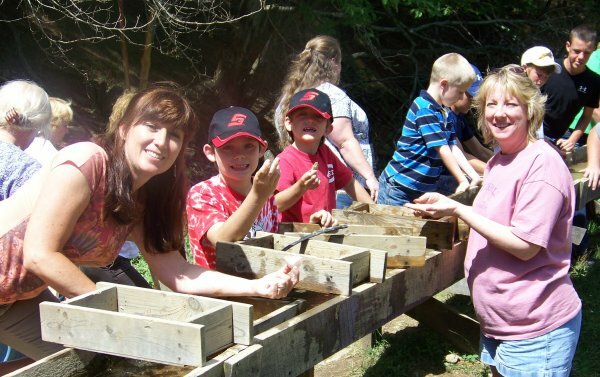 Here at Randall Glen our gem miners always have a good time, and always find treasure! This is our pledge to you: We believe that Randall Glen provides the best gem mining value anywhere. We guarantee that our gem dirt has loads of gems, and we NEVER sort through our gem dirt to take out “the good stuff” before you get it. Whether you mine here or order gem dirt at home, with Randall Glen gem dirt you have every chance of making a spectacular find. Randall Glen customers have had stones cut that appraised at $1,000, $3,000, and even $5,000 per finished carat. And specimen size gems are commonplace in our gem dirt! Here at the mine, in one bucket a customer found a 445-carat sapphire and a 448-carat ruby. We take pride in the richness of our gem dirt, and we believe you’ll be very happy with your mining finds.